In its original, spider-web incarnation, Marmot's Power Stretch was my single most used glove in the backcountry—I loved it. The early Power Stretch featured a web-like lattice of plastic on the fingers and palm to provide better grip on ski poles and ice axe shafts. The Power Stretch's grip was not in the same league as a dedicated climbing glove, but it was more than good enough to let you climb with reasonable confidence in a variety of contexts. Unfortunately, a negative consequence of the Power Stretch's enhanced grip was that it was very difficult to use the glove as a bona-fide liner. The plastic lattice added just enough thickness and bulk to make it difficult to get the glove into an outer shell easily. Marmot addressed this issue by junking the entire concept: the redesigned Power Stretch eliminated the plastic grip web, featuring instead just a plain fabric palm. You might think of this as a gentle nudge from Marmot: if you want a climbing glove, they're telling you, get a real climbing glove. Still, for me, that original Power Stretch was just fantastically useful. So what of the current model? Today's Power Stretch glove adds low-profile "Grip Tec" patches to the fingertips, not so much for tool grip as to make it easier to play with your camera, phone, or other device. I could do without it. 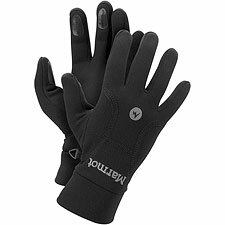 Marmot's Power Stretch glove remains a champ in terms of comfort, however, thanks to its use of Polartec's magically-stretchy Power Stretch fabric. Really the bottom line on these is that if you don't have them, or a glove like them, you really ought to get a pair, grippy or not. They're just incredibly versatile, and, truth be told, you can adapt to the slick-on-metal feeling if you need to. Weighing a barely-there 1.4 ounces (men's medium), they're highly appealing as backup gloves—but don't be surprised if you find yourself wearing them more than anything else.